Most believe that the Dodgers need another starter, if not to provide four quality post-season arms, then to give them insurance should one of their relatively fragile top three starters (Clayton Kershaw, Alex Wood, Rich Hill) not make it in one piece to October. One name in particular has emerged in Dodgers’ search for a starter thus far: Rangers right-handed ace Yu Darvish. And why wouldn’t he be at the top? He’s an elite talent with front of the rotation bonafides. 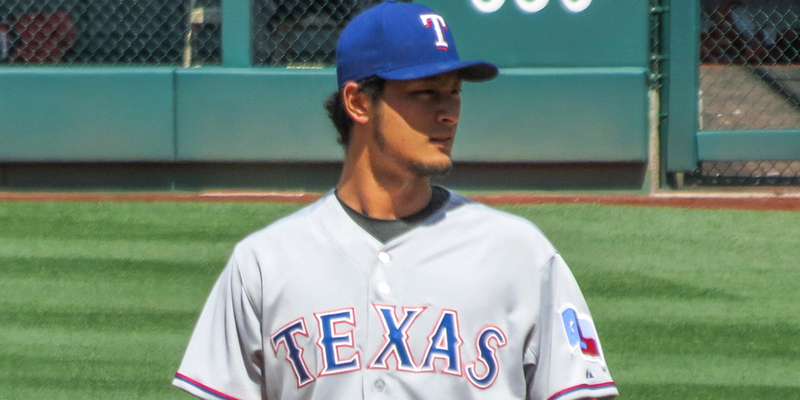 Of course, the Dodgers having interest in him is nothing new, but what is new is a report by Jerry Crasnick of ESPN that Darvish is now being made available by the Rangers. Sources told ESPN that Rangers general manager Jon Daniels began calling potential suitors Monday and telling them the team is open to trading Darvish for the “right deal.” If no team offers a return package to the Rangers’ liking, Daniels has informed clubs that Texas will hold on to Darvish and continue to make a push in the American League wild-card race. So now that Darvish is reportedly available, it comes down to what exactly the Rangers price is, and Jon Paul Morosi of MLB.com says it could be rather steep. The Dodgers scouted Darvish’s most recent start, Friday against the Rays, and possess the farm system necessary to make a compelling offer. Sources say the Rangers are likely to ask the Dodgers for at least two of the following prospects: right-hander Walker Buehler, center fielder Alex Verdugo, second baseman Willie Calhoun and right-hander Yadier Alvarez. For a rental? That’s absolutely brutal. In MLB.com’s recently updated Top 100, Buehler ranks #13, Verdugo is at #28, Alvarez checks in at #58, and Calhoun round out the quartet at #71. Usually the price for rentals like these is one prospect in the ranking area of the quartet plus other promising lower-level talents, so this would definitely be a high ask. Of course, when Dustin and I looked at potential trades for Darvish, I don’t think we were that far off. Considering that Diaz is ranked at #89 in the Top 100 at MLB.com, I suppose it wouldn’t be a huge stretch to include Alvarez and Calhoun. However, the packages we put together were likely already pushing the boundaries of sanity for a rental, so we’d like to see the Dodgers try to give up only one of the top four somehow. Despite the risk of Darvish’s lowered strikeout rate and surrendering potentially two impact talents, his addition to the Dodgers would provide a sense of security to an already elite team. In the best-case scenario, Darvish would potentially give the Dodgers four starters with true talent levels in the sub-3 ERA range in their playoff rotation. In the worst-case scenario, Darvish would provide insurance against one or more of the current rotation arms getting an untimely injury, and he would keep them well within range to lift the trophy after the season is done even if one should fall. While I don’t necessarily think making a deal for Darvish is the smart thing to do, and odds are better that they’ll regret it in the long run rather than cherish it, I don’t see a much better opportunity to do a deal like this for the Dodgers. I loathe to agree with the annoyingly overwhelming consensus in the press, but within the context of the Dodgers having an extremely talented team that’s ready to win now, but also having a potentially disastrous end should the rotation options falter late, this seems like a prime moment for the front office to cash in some of the outstanding work they’ve done rebuilding the farm system.